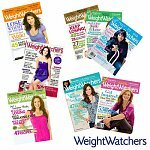 Discount Mags has Weight Watchers Magazine Subscription for $3 (up to 3 years) after applying coupon code FIT2011. Hey thanx for stopping by my "Mom-dom" and following. I appreciate it! I've been looking through your blog...you have some great craft/activity ideas. My kids LOVE crafts..even my 12 year old.I am always looking for new things for the boys to do! Can't wait to read more! Have a great New Year!! following you back :) - which FB page did you want me to follow and twitter? these are some great mags!